Have you been searching for a great, small garbage disposal? I understand that so many of these appliances take up a large amount of space underneath your sink. This makes it tough to store things there properly. (And if you’re like me, you need every bit of storage space that you can get.) Thankfully, there’s a potential solution to this problem – the Insinkerator Badger 1 garbage disposal. 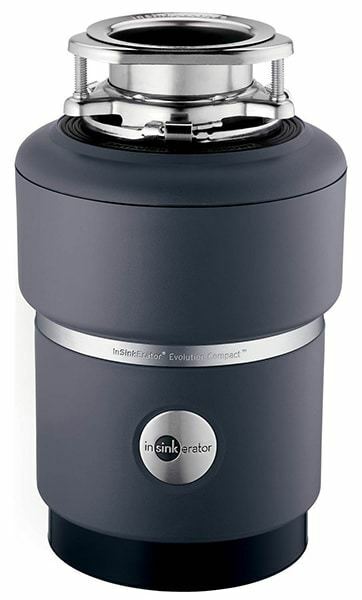 This garbage disposer is designed to be compact and produce only a small amount of noise when compared to similar units. But does it live up to its claims? Is its installation process easy? I’m going to examine the Badger 1 in some detail in order to come up with answers to those questions. Read on to find out more! 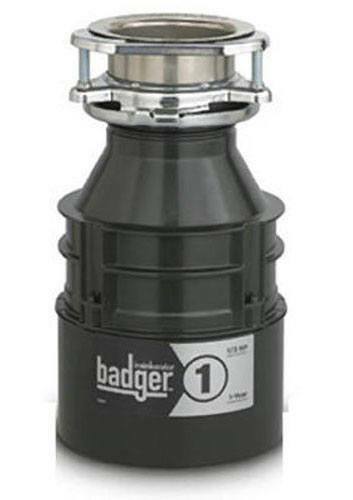 The Badger 1 garbage disposal runs off of a 1/3 horsepower Dura Driver Induction motor. This type of motor is patented by Insinkerator (the company that manufactures the device). The speed of the motor is directly correlated to the power of the grinding gears. Essentially, it ensures that your food waste is ground up into tiny particles before it goes down the pipes into your sewer system. Speaking of which, the Badger 1 has a single grind stage. It’s a little less complicated that fancier machines that have multiple grind stages, but there have to be some tradeoffs in order to compensate for the smaller size of this machine. 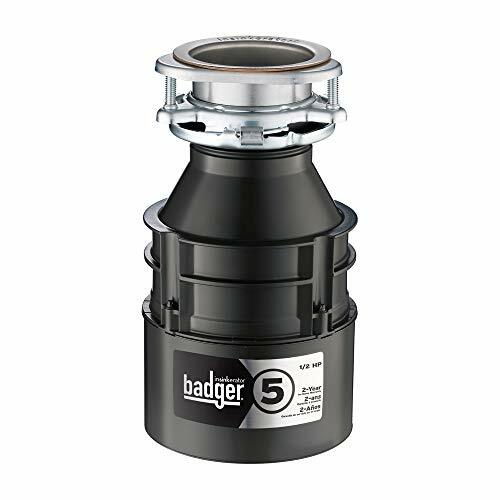 On top of this, the Badger 1 garbage disposal has a continuous feed design. This means that you don’t have to place food in it, plug up the top, and then wait for the chamber to get full before you turn it on. Instead, you just have to place your scraps in the garbage disposer, turn it on, and then you can add more scraps as it runs. These types of disposals tend to make less noise, since less waste is in there at once, and they are much more sanitary. For example, you don’t have to worry about food rotting away in the garbage disposer until you have a chance to run it. The Badger 1 measure seven inches by seven inches by 12 inches, making it very compact. You’ll be hard pressed to find a smaller functional garbage disposer. This one has a 26-ounce grind chamber that’s made out of stainless steel. The grinding blade is also stainless steel. Overall, this device weighs 12 pounds (because it is made entirely of metal) and it runs on 120 volts of electricity. It utilizes a wall switch and comes with a one-year full parts and in-home service warranty. The exterior of the Badger 1 is gray, making it blend in with everything else that you have stashed under your sink. Not only is the Badger as small as it claims to be, but the installation process is fairly easy. All that you have to do is follow the instructions and use the included supplies, which will connect the device to your sink’s drain. However, keep in mind that it doesn’t come with a power cord. 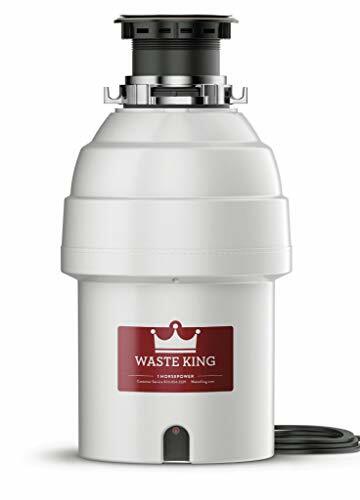 You can order one when you purchase this garbage disposer, but if you previously had a disposal installed (and are just replacing it with this one, like I am), then your current power cord is more than likely compatible. With that said, if you want to play it safe, then feel free to order your power cord at the same time that you order the Badger. As far as noise is concerned, it’s very quiet. According to my experiences, it’s one of the quietest garbage disposers that I’ve tested. I was able to have a conversation in the same room with the appliance running, and didn’t have to shout or anything. That’s great, as many similar devices are quite noisy. I also need to mention that the Badger 1 is made entirely in the United States. This is an important point, as many people prefer to purchase locally made appliances. After all, doing so provides jobs to people in this country – and there’s always a sense of pride that goes along with this. This appliance, the Badger 1, is made by the Insinkerator Company. They have been in business for over 75 years and are currently owned by Emerson, a global company that makes home appliances, ceiling fans, thermostats, refrigeration units and more. Some of their products are designed for commercial use, while others are for in-home use only. You’ll find that all of their products are quite reliable. The Insinkerator Company was founded in Racine, Wisconsin back in 1927. John W. Hammes founded the company when he essentially invented the in-sink (where the name comes from) garbage disposal at his wife’s request. Over the course of ten years, Hammes refined the product before he started to manufacture it commercially. He named the business the In-Sink-Erator Manufacturing Company and sold it in 1968. Over time, the dashes in the name were removed in order to streamline the logo. However, the main idea behind the line of appliances remains, as they still manufacture in-sink garbage disposals. Overall, I highly recommend the Badger 1 garbage disposal. This unit lives up to its claims of being both small and quiet. The installation process is quite simple, and only took 15 minutes from start to finish (keep in mind that I’ve done this before, so I’m quite experienced.) However, you can always have a plumber install the unit for you if you’re unsure of what you’re doing. It’s always better to be safe than sorry. The small size of this garbage disposal makes it completely worth it. It’s tough to find one that manages to not take up much space, while reliably grinding up food waste at the same time. This one certainly does both. If you’re interested in purchasing the Badger 1, then click here.